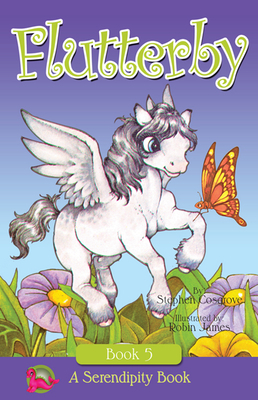 A tiny winged horse named Flutterby flies about the island of Serendipity trying to discover her special purpose in life. Through a series of magical misadventures, she discovers she is very special just being herself. Stephen Cosgrove is one of the best-selling children's book authors of all time. His writing career began in 1973 when, while shopping at bookstores for his three-year-old daughter, he was frustrated by the lack of fun-to-read picture books that also convey positive values. Consequently, he decided to write his own stories. Cosgrove went on to create four titles that became the foundation of his best-selling Serendipity series, which has sold over 80 million copies worldwide. Since then, he has written more than 300 books, some under his own name and others using pseudonyms, ranging from picture books to young adult thrillers. The winner of the Coors Lumen Award for family values and multiple Children's Choice Awards, he lives in Austin, TX. Robin James is a gifted illustrator and a native of the Pacific Northwest. She has loved art and animals all her life and has been drawing ever since she could hold a pencil. Through the years, she has created a wide variety of artwork from animal portraits to wildlife paintings and has illustrated over 75 children's books, and is published worldwide. She lives in Snohomish, WA.